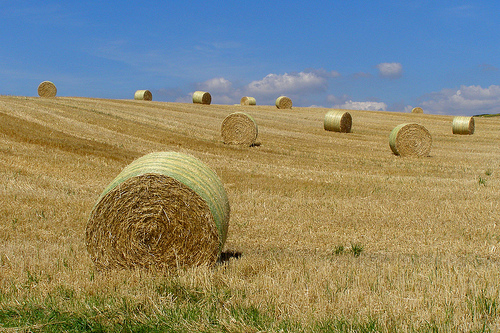 A wide range of thermal technologies exists to convert the energy stored in biomass to more useful forms of energy. These technologies can be classified according to the principal energy carrier produced in the conversion process. Carriers are in the form of heat, gas, liquid and/or solid products, depending on the extent to which oxygen is admitted to the conversion process (usually as air). The three principal methods of thermo-chemical conversion are combustion (in excess air), gasification (in reduced air), and pyrolysis (in absence of air). Pyrolysis is the term given to the thermal degradation of wood in the absence of oxygen. It enables biomass to be converted to a combination of solid char, gas and a liquid bio-oil. Pyrolysis technologies are generally categorized as “fast” or “slow” according to the time taken for processing the feed into pyrolysis products. These products are generated in roughly equal proportions with slow pyrolysis. 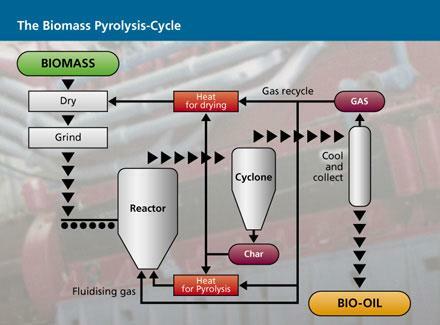 Using fast pyrolysis, bio-oil yield can be as high as 80 percent of the product on a dry fuel basis. Bio-oil can act as a liquid fuel or as a feedstock for chemical production. A range of bio-oil production processes are under development, including fluid bed reactors, ablative pyrolysis, entrained flow reactors, rotating cone reactors, and vacuum pyrolysis.